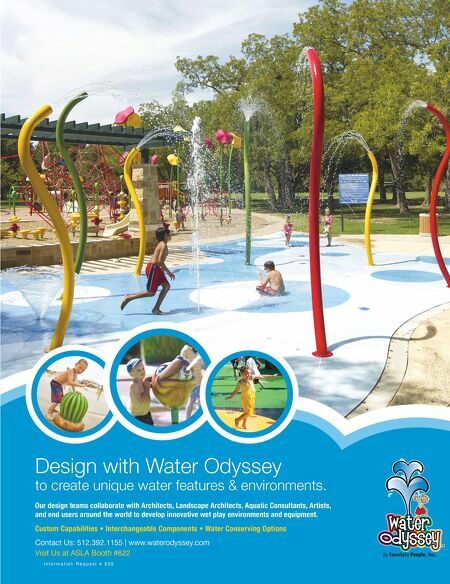 74 Landscape Architect and Specifier News Fellowship Park (Continued from page 72) from residential neighbors. Initially, the Church wanted a permanent amphitheater built with a large space frame canopy, interior dressing rooms, staging areas, multi-media technology, and more. With protests against the potential noise pollution the amphitheater would bring, Cape Christian opted instead for a quick service restaurant known as Tony & Ada's Café. Cape Christian faced one last challenge in the overall budget and time frame. 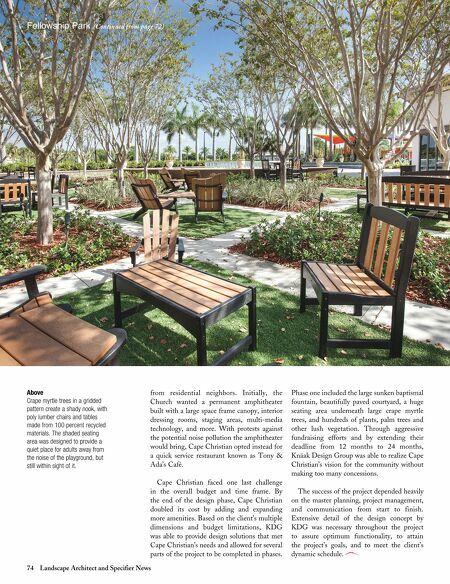 By the end of the design phase, Cape Christian doubled its cost by adding and expanding more amenities. Based on the client's multiple dimensions and budget limitations, KDG was able to provide design solutions that met Cape Christian's needs and allowed for several parts of the project to be completed in phases. Phase one included the large sunken baptismal fountain, beautifully paved courtyard, a huge seating area underneath large crape myrtle trees, and hundreds of plants, palm trees and other lush vegetation. Through aggressive fundraising efforts and by extending their deadline from 12 months to 24 months, Knäak Design Group was able to realize Cape Christian's vision for the community without making too many concessions. The success of the project depended heavily on the master planning, project management, and communication from start to finish. Extensive detail of the design concept by KDG was necessary throughout the project to assure optimum functionality, to attain the project's goals, and to meet the client's dynamic schedule. Above Crape myrtle trees in a gridded pattern create a shady nook, with poly lumber chairs and tables made from 100 percent recycled materials. The shaded seating area was designed to provide a quiet place for adults away from the noise of the playground, but still within sight of it.